Bulk SMS Malaysia | Lowest SMS Rate 10 sen only - lowest price & most reliable Bulk SMS marketing tool, 2 way sms Malaysia, works with Bulk SMS Singapore, online sms solution, web sms marketing. 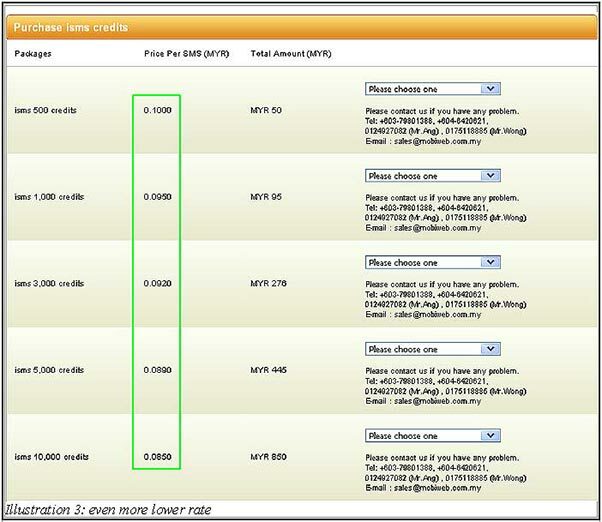 Starting from 10 sen per SMS, you can enjoy the lowest rate ever in iSMS. You can check out iSMS complete rate list HERE. Or click on bulk sms rate at the menu bar. iSMS complete rates page will display all rates from supported mobile networks. Besides that, you can see that Malaysia users enjoys the lowest rate for sending a message with just 10 sen. Compared to other mobile telecommunication service providers, their price is slightly expensive compare to us. Moreover, the more iSMS credits you purchase, the lower rate you will enjoy. Below is an example of iSMS rates. If you are interested in getting a more exciting rate or purchase more iSMS credits, you can give us a call.